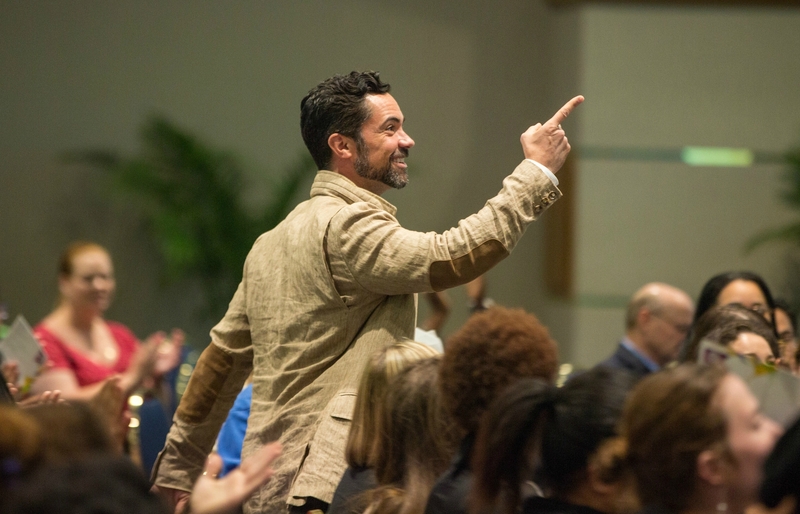 Danny Pino ’96 led a Q&A session with students and staff during FIU’s 2018 Diversity Week. 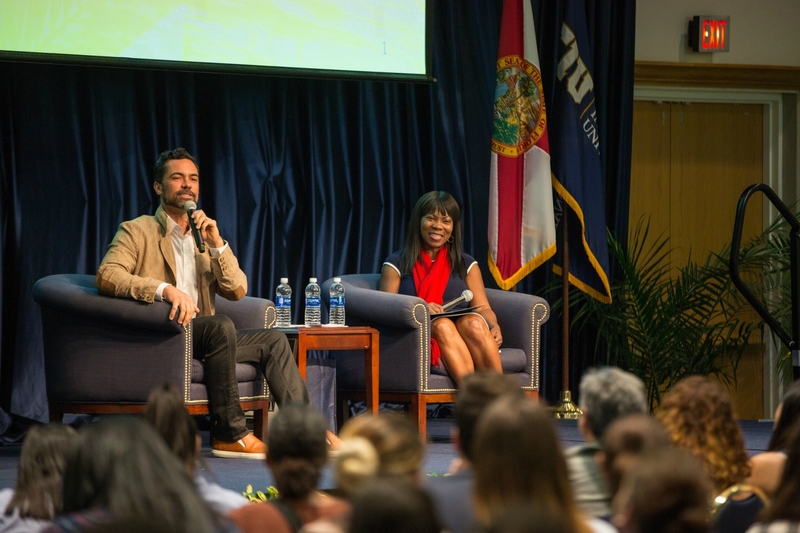 Danny Pino ’96, known for detective roles on the crime dramas Cold Case and Law & Order: Special Victims Unit, returned to FIU on Monday for a candid discussion with students and staff on professional growth and diversity in the field of acting. A graduate of FIU’s Honors College who majored in theatre, Pino’s Q&A session headlined FIU’s 2018 Diversity Week, a celebration of inclusion and embracing of the many cultures represented at the university. Moderated by Shirlyon McWhorter, the director of the Equal Opportunity & Diversity Program at FIU, Pino answered questions submitted by students, including some from FIU’s Department of Theatre. One student asked Pino, a native of Miami and the son of Cuban immigrants, to discuss the debate regarding a lack of diverse roles in Hollywood. McWhorter added this statistic: According to a University of Southern California study, only 3 percent of speaking characters in the top 100 performing films of 2016 were Latino. “Hollywood is not going to change on its own, right? I think it is a multifaceted problem. The challenge is there needs to be more content written for actors who are in the minority, whether it is racially, whether it’s how they identify sexually. There are huge gaps, not only for Latinos, in what Hollywood represents as our society. But we’re also responsible as consumers. We need to support the people that we want to see,” Pino said. He called theatre students in the audience to action, asking them to create more diverse roles in the scripts they may go on to produce in the future. Students also asked Pino to discuss the path that led him to success as an actor – one that he admitted was not easy. When Pino was just beginning his professional acting career, he and his wife Lily (also an FIU graduate) moved to Los Angeles, sleeping on a friend’s couch while she taught English and Pino auditioned every day. Four months passed without landing a single role. And then something even worse happened: He auditioned for another role, and after reading the script, the casting director told him he was the perfect guy for the job. Three days later, after excited phone calls to his agent, Pino found out they’d given the role to John Leguizamo instead. “There were times when it would bring me to tears, and I was like, ‘What do I do? What do I do? '” he said. But he stuck it out and, sure enough, started landing roles. After only a few years, he had worked his way up to a lead role as Detective Scotty Valens on the CBS crime drama Cold Case, which ran for seven seasons. Freshman theatre major Summre Raimer said Pino’s message of perseverance eased her nerves about breaking into the acting profession. Like Pino, who attended New York University’s Tisch School of the Arts after graduating from FIU, Raimer hopes to go to graduate school for acting and then hire an agent and move to Hollywood. “Hearing that it took so long to get that first gig – it’s just good to know that even though it does take long, as long as you pursue it and just be in it, you’ll end up succeeding,” Raimer said. The casting director for Cold Case was the same casting director who had previously cast Pino for a recurring role in FX’s The Shield. Their experience working together made for a networking connection that paid off unexpectedly months later. “If you put all of what you have into your work and you’re collaborative, people will remember that, and often times it pays off,” he said. He also reminded students that success in acting – and in life – is about the people you surround yourself with. And at FIU, he said, theatre students have the advantage of having professors like Phillip Church, Lesley-Ann Timlick and many more, who ensure they receive an education that prepares them for the workforce and for life. Diversity Week continues through Sunday, April 8. Upcoming activities include a showcase of female inventors, a discussion on racial justice and a trip to the Miami Beach Pride Parade. Click here to view all 2018 events.